Put your home in the best light with perfectly placed pendants. To learn more about the ALA Lighting Makeover Contest, or to enter in person, visit a Hortons showroom near you. What type and height of hanging light should we use over a sink in a small powder room? Two small mini-pendants on each side of the face will provide the best light with good distribution. The bottom of the pendants should be approximately five feet above the floor to avoid exposing the bottom of the light. Recommended bulbs include a 60-watt, soft white incandescent; 18-watt dimmable compact fluorescent; or LED. For maximum flexibility, install a simple dimmer switch. Are there any concerns about using mini-pendants on either side of the mirror in a bathroom? There are restrictions if the fixtures are closer than 36 inches to a tub or shower. Outside of the 36-inch zone, any type of hanging fixtures are fine. To get all the answers to your home lighting questions, contact an Hortons showroom. 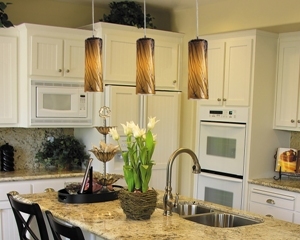 Two common mistakes homeowners make when installing pendant lighting in the kitchen are not placing them at the proper height and not installing enough. Each pendant should be mounted so that the bottom of the shade is approximately 66 inches above the floor. At that height, it is possible to look across the room below the pendants, and still create a dramatic focal point. If the shades are not very deep and there is seating at the kitchen island or peninsula, install the pendants a few inches lower, say 60 inches above the floor. Place one pendant for every two feet of counter space. For example, a six-foot island requires three pendants – one in the center with another 20 inches on each side. Usually, an odd number of pendants over a counter or island create better balance. Size also matters when determining spacing and amount of pendants. Thin, narrow pendants might look better with the addition of one or two extra fixtures. When it comes to selecting and installing pendants for your home, the best advice is to visit your local Hortons showroom.